It's been a busy few weeks for us here at Just Collect. We've been getting ready for The National (which is next week! ), we just came back from a buying trip out in California, we're in the process of completely re-designing our website, and we still have our weekly eBay auctions to attend to! It’s been so busy, we even had to hire two new employees! While all that was going on though, we still found the time to meet with a few locals who wanted their collections appraised. We ended up buying a really neat collection, which we're happy to share with you. You may or may not remember that story on the CBS New York news a few months ago, where a man found a bunch of Babe Ruth cards hidden in his apartment wall. The story is quite interesting, and I was asked to provide some insight on the newly found treasure trove. So, the news station came and interviewed me, which you can see at the end of the story. Pretty cool! Well, if that wasn't enough, a woman from New York had watched the news that night and decided to give us a call. She had a collection of old baseball cards from her late husband. Coincidentally enough, she had just started to do her own research on the collection, and knew that they were pretty valuable, but she was hesitant to do anything because she didn't know who to trust. But after seeing us the on news that night, she gave us a call and spoke to our head specialist. A few weeks had passed, and she finally gave us a call back. This was a big deal for her, so we don't blame her for doing her due diligence. We had provided her with a preliminary evaluation of the collection, but needed to see the cards in person to make an official offer. Since she was located in the City and didn't have access to a car, coming down to Somerset was out of the question, so we set up an appointment with her a few days later at our satellite office in Hoboken, NJ. The collection only consisted of about 20 cards, but you could tell that even though the gentlemen was on a budget, he had real good taste - which is why it's filled with the likes of Mikey Mantle, Lou Gehrig, Ted Williams, Satchell Paige, etc. The best card in the collection is probably the 2nd year Satchell Paige card, which comes from the 1949 Bowman set. Even in low grade, that card is worth hundreds of dollars, and is wanted by all types of collectors throughout the hobby. My favorite card of the bunch is the 1928 F50 Ice Cream card of Lou Gehrig (middle). This card is actually pretty rare, as PSA has graded only about 50 of them, with the highest grading out at NM/MT. This one obviously isn’t NM/MT, but we’re sending it out to PSA for grading anyway. Gehrig is of the greatest to ever play the game, and he’s also a Yankee, so I have some bias towards this card. Talk about old! Do you see that first card pictured? That card is from 1888! It hails from the artsy Allen & Ginter set, and features Joseph Fogarty. He’s nobody special, but it's a super rare card that only comes up for sale two, maybe three times a year, tops. According the PSA's population report, there are less than 50 in existence. Some people don't even collect these cards for the players, they actually collect them for the artwork - and that artwork is something that we can all appreciate. Another great card from this collection comes from 1948 Leaf set, and is of The Greatest Hitter That Ever Lived, Ted Williams. The card is in pretty decent shape... no creases, stain-free, and exhibits full borders, so we see this card doing well at auction too. These are the best cards from the collection, and they've all been sent out to PSA for grading. We'll be auctioning them off towards the end of the summer. I remember getting all excited to be on that CBS evening new piece, but it was on so late (11:15 PM) that I was afraid most people would miss it. Well, it turns out that wasn't the case! Just like this woman, we know that there are more people out there in New York with collections. We would love to hear from you! 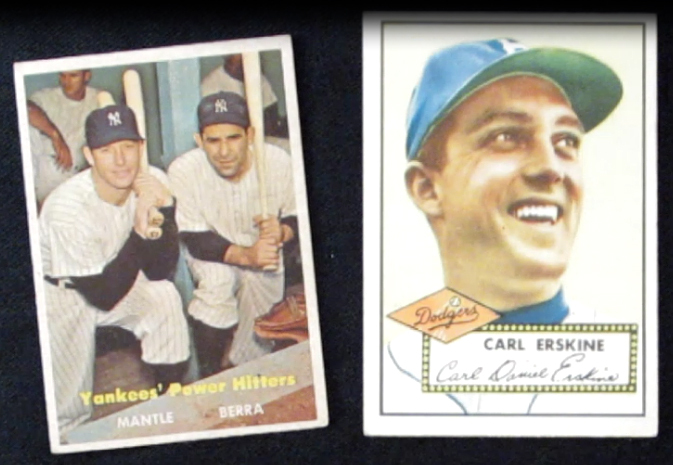 If you have a vintage sports card collection, and are serious about selling, contact us today! We'll provide you with a free appraisal and an offer within 48 hours. If your collection is either too large or too valuable to be shipped, and you cannot make it down to our office, we'd be glad to come to you.